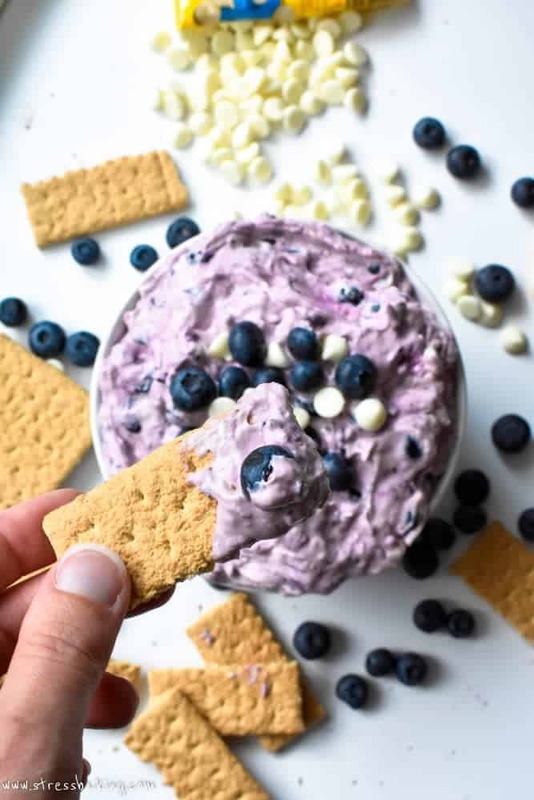 This tangy cheesecake dip is the ultimate no bake dessert with fresh blueberries, white chocolate chips, and perfectly pairs with graham crackers for dipping! Recently, I bought entirely too many blueberries. WAY too many. Just… an absurd amount. I don’t know what I was thinking at the time. I had enough to make a blueberry pie, another blueberry pie, garnish for this mango ginger sangria, and still had a bunch leftover. Honestly… that’s just an absurd amount of blueberries. I decided to make something besides yet even more blueberry pie, and came up with this concoction. Originally, I was going to try to make a blueberry cheesecake. But, I didn’t have enough graham crackers, or cream cheese, or really any of the ingredients I needed. Except for the blueberries of course, because apparently I’m hoarding them for the apocalypse. 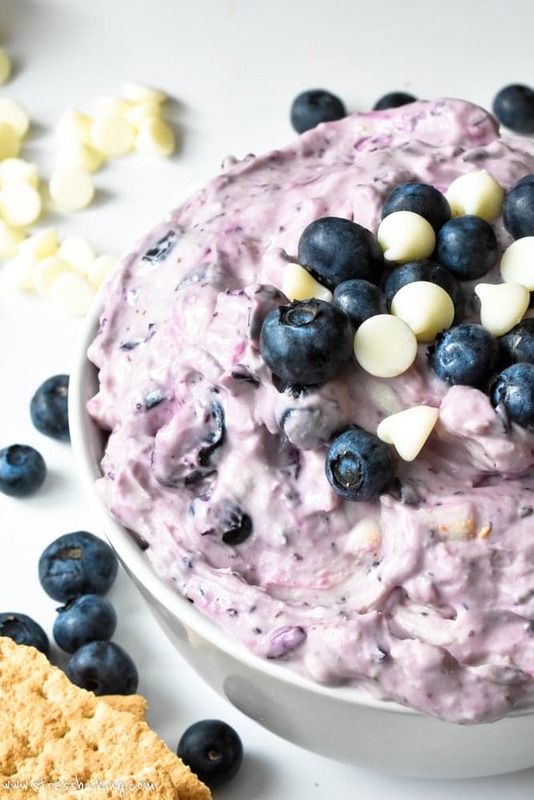 So, as a result of my poor planning, this blueberry cheesecake dip was born. This is super easy to whip up, doesn’t require making a blueberry reduction over the stove, or any baking of any kind. Totally no bake. You just need a blender or food processor and a hand mixer, and you’ll be all set to serve this up in about ten minutes. Mind you, I would recommend making this ahead of time so that it has time to chill, because it really does make the flavor more intense and bold. If you like cheesecake and you like blueberries, then this is the perfect way to have blueberry cheesecake without turning on an oven. Just grab some graham crackers and get to dippin’! I tried it with honey graham crackers and chocolate graham crackers, and TBH I kinda loved the chocolate with it. There was something about the flavor combination that was a little unexpected, but delightful. 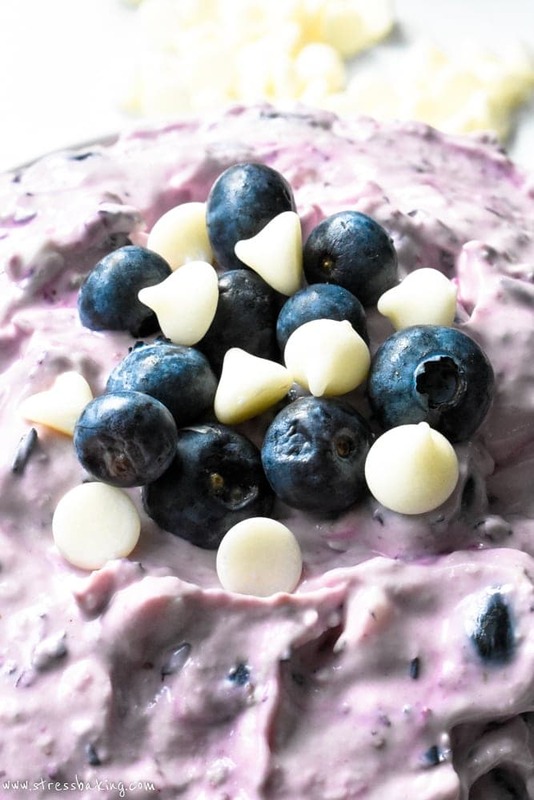 If you’re not into blueberry, give this no-bake pineapple cheesecake whip a shot! And if you’re not feeling a dip and want the real deal, just make this incredible New York style cheesecake and bury it in blueberries. 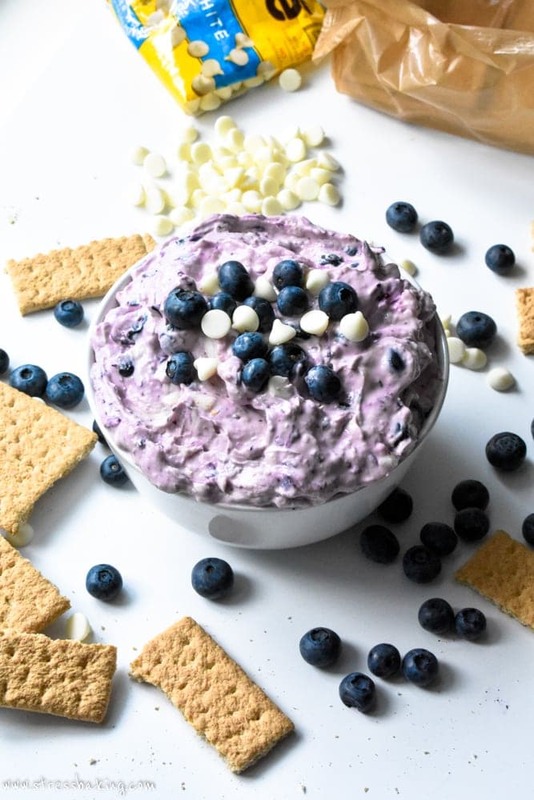 Sweet and tangy, this cheesecake dip is jam packed with fresh blueberries and white chocolate chips, and perfectly pairs with graham crackers for dipping for the ultimate no bake party dessert! In a medium bowl, use a hand mixer to mix cream cheese and powdered sugar until well combined. In a blender or food processor, add 1 cup blueberries and pulse a few times until it’s a bit liquidy (but not to pure liquid form – you want it lumpy). Add blueberry puree, lemon juice and vanilla extract and combine on low to medium speed. Fold in whole blueberries, white chocolate chips, and lemon zest until combined. Serve with graham cracker sticks for dipping, and enjoy! Keep in an airtight container in the fridge for up to five days. I over-buy blueberries ALL of the time. There are so many times I can make pie or top with yogurt, and this is a great idea! When I go to pick blueberries I have the too many blueberries problem! This dip looks so creamy and good! I think my kids would like this! Love the name of your blog! Oh my goodness – this is sheer decadence! I adore blueberries and white chocolate together, and during the summer I usually have a fridge beyond-fully-stocked with blueberries. What a fun recipe and terrific showcase for the season’s gorgeous fresh berries! Such a creative idea! 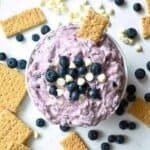 I would’ve never thought about making a cheesecake dip! I’ve seen dips similar do I might need to give it a try. Cheesecake dip? All the flavor and none of the hassle?? OK,so that works… And the berries look so good – I can understand why you got so many! Cheesecake dip? WOW that sounds amazing! Soo going to try this! I love cheesecake and I love blueberries, and I too am hoarding them for the apocalypse. Looks like I’ll be having some of this dip in my future because I am too damn pregnant to make a full cheesecake anyways. 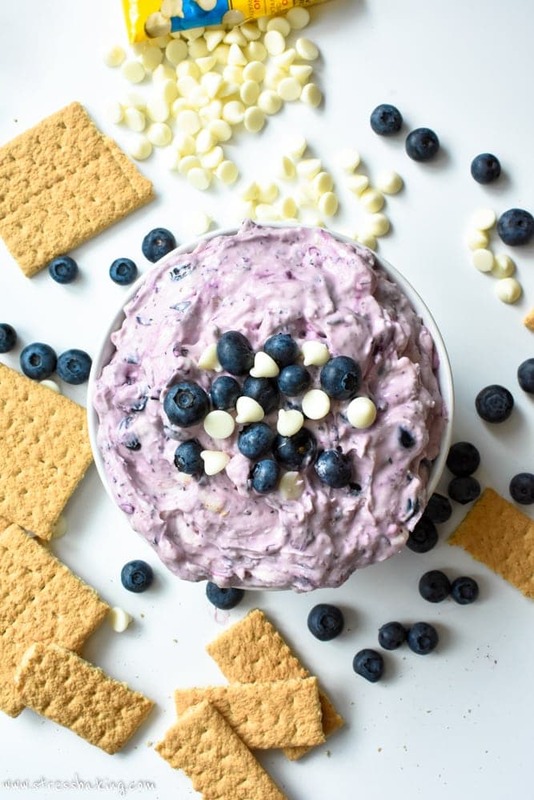 Cheesecake dip has got to be one of life’s greatest pleasures! I think this recipe would be great to take to summer bbq’s and potlucks! And it looks fairly customizable, so you can use just about any fruit you want! Love it! OMG this is perfect for summer get togethers! We like to have wine and cheese nights with friends on the porch. This would be great at the end of the evening, but I can even see this as an appetizer with a bottle of reisling. Looks amazing! My daughter and husband would love this! I bet shortbread would be amazing! I”m pinning this one so that I can make it soon! This looks like a perfect snack for a summer afternoon! I love blueberries and I have been busy picking them all weekend! I am going to make this tomorrow! Cheesecake dip?! Say what? I am a big fan of this concept. Idk why I’ve never heard of it before, but I’m pretty sure I need it in my life. This would be perfect for an at-home brunch. Oh my gosh – what an insanely good dessert! 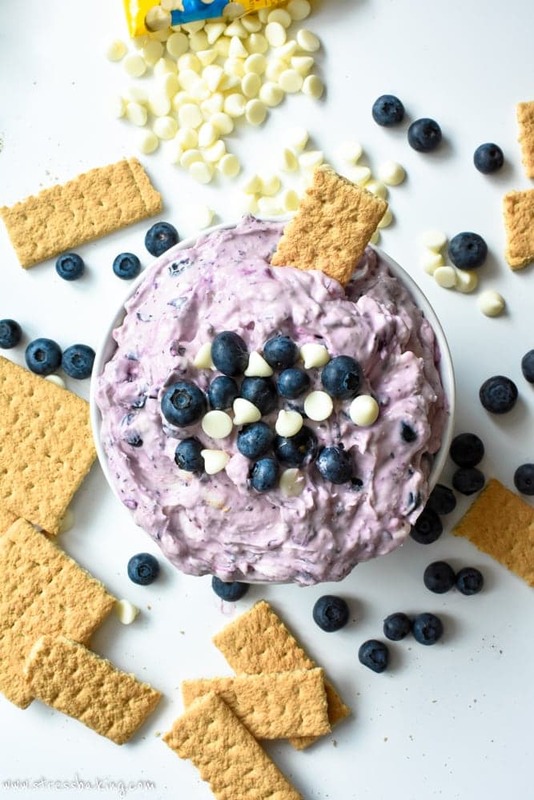 I love blueberries AND cheesecake … this dip seriously looks so good. I love your photos, too!